Paper Pawz: Lawn Fawn Valentine! 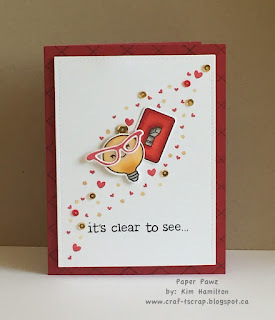 I had fun with this one, I used two sets from Lawn Fawn: Clear to See, You Turn Me On and the Argyle border stamp for the card base for this Valentine's Day Card! I started with the light bulb and light switch from You Turn Me On and I thought the glasses from Clear to See would be cute. I framed the two images with a series of Lawn Fawn small hearts and stars with red and gold inks and some PPP sequins. The sentiment is from Clear to See and the inside says "You are the one for me!"